Displaying 1-49 of 49 items. Five fun favorites specially chosen and arranged in two-parts for young groups and choirs. A perfect introduction to part singing for young singing groups. The included CD contains complete vocal and piano demonstrations plus piano only accompaniments to each song. Celebrate musical theatre with hits from Joseph and the Amazing Technicolor Dreamcoat, Wicked, The Sound of Music, Les Misérables and Rent. It's the sound of Broadway! 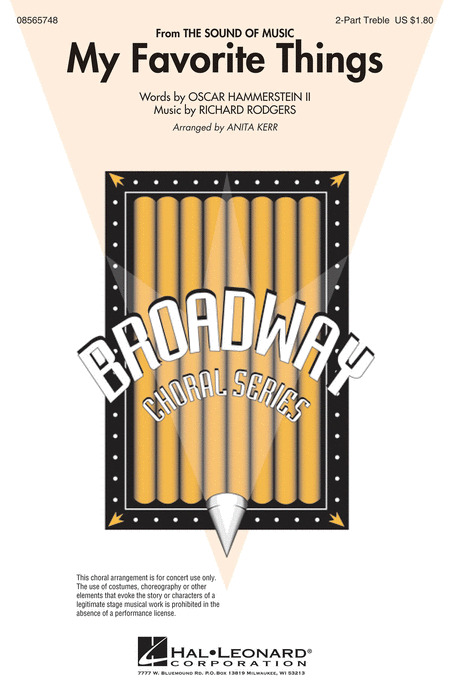 This unique musical collection of Broadway hits is perfect for group singing in the classroom, choir or community. 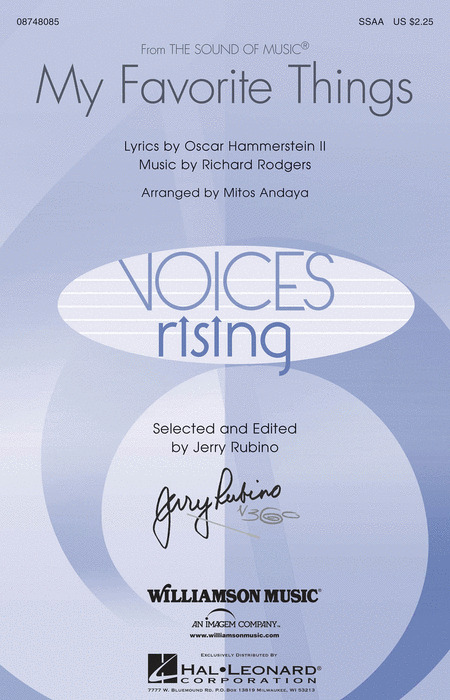 These songs have been carefully arranged for young unison voices with some optional harmony. The Piano/Vocal Collection offers the fully accompanied song, and the Singer Edition comes in handy paks of ten and provides vocal parts only. These are songs that everybody knows and loves and these wonderful classics are sure to please. Especially arranged for younger choirs, these classic Rodgers and Hammerstein songs are a wonderful introduction to the music of Broadway. Crafted for success, this setting will be a joy to rehearse as well as perform. Just like the Von Trapps, when you know the notes to sing, you can sing most anything! A perfect choice for any concert program! Easy piano arrangements of 8 popular songs from the musical masterpiece, including: Climb Ev'ry Mountain - Do-Re-Mi - Edelweiss - Maria - My Favorite Things - Sixteen Going on Seventeen - So Long, Farewell - The Sound of Music. Big-note piano arrangements of 8 classics, including: Climb Ev'ry Mountain - Do-Re-Mi - Edelweiss - The Lonely Goatherd - My Favorite Things - Sixteen Going on Seventeen - So Long, Farewell - The Sound of Music. Easy arrangements by Phillip Keveren of 9 favorites from this beloved Rodgers & Hammerstein classic: Climb Ev'ry Mountain - Do-Re-Mi - Edelweiss - The Lonely Goatherd - Maria - My Favorite Things - Sixteen Going on Seventeen - So Long, Farewell - The Sound of Music. 21 holiday songs from this timeless standards crooner and one who's probably best-loved for his Christmas recordings and TV shows. The songs are presented in vocal arrangements in the original keys as sung by Williams. This publication is a hit! With 33 great songs from stage and movie musicals - plus plot notes for each - this series is indispensible for teaching young singers. A three-book series of large collection of theatre and movie musical songs for teens, with no songs duplicated from the best-selling The Teen's Musical Theatre Collection. There are over 35 songs in each volume, with enough variety to keep any stage-struck teen singing for months. Songs range from the classic musicals, to Disney movies, to contemporary Broadway shows. These popular publications are compiled especially for the tastes and abilities of the talented teenage singer/actor. Songs span from classic stage musicals, to the golden age of Hollywood, to the stage and cinema of the 1980s and '90s. Indispensible for teaching young singers, these book/CD packs also include notes on each selection. Titles in the Original Keys for Singers series are designed for vocalists looking for authentic transcriptions from their favorite artists. The books transcribe famous vocal performances exactly as recorded and provide piano accompaniment parts so that you can perform or practice exactly as your favorite artists sang them! Here are timeless versions of 25 Christmas classics as performed by the men who made them famous. Includes: Blue Christmas (Elvis Presley) - The Christmas Song (Chestnuts Roasting on an Open Fire) (Nat King Cole) - Happy Xmas (War Is Over) (John Lennon) - A Holly Jolly Christmas (Burl Ives) - It's Beginning to Look like Christmas (Perry Como) - White Christmas (Bing Crosby) - and more. Pro Vocal : Songs Children Can Sing! Whether you're a karaoke singer or preparing for an audition, the Pro Vocal series is for you! The book contains the lyrics, melody, and chord symbols for eight classic songs. The CD contains demos for listening and separate backing tracks so you can sing along. The CD is also enhanced so PC & Mac users can adjust the recording to any pitch without changing the tempo! Perfect for home rehearsal, parties, auditions, corporate events, and gigs without a backup band. Whether you're a karoake singer, aspiring vocalist or preparing for an audition, the Pro Vocal series is for you. The book contains the lyrics, melody, and chord symbols for eight hit songs. The CD contains demos for listening, and separate backing tracks so you can sing along. The CD is playable on any CD, but it is also enhanced for PC and Mac computer users so you can adjust the recording to any pitch without changing the tempo! Perfect for home rehearsal, parties, auditions, corporate events, and gigs without a backup band. Great for holiday singing with the family. The most accomplished composer in the history of the American musical theatre was Richard Rodgers (1902-1979), with a professional career on Broadway that spanned more than 50 years. In an edition designed especially for singers, 45 songs have been carefully chosen from both the Rodgers & Hart and Rodgers & Hammerstein output. The accompaniments support the singer, rather than containing the melody in the piano part throughout, as in the standard sheet music editions of these songs. Most of these songs are transposed for the first time ever in this new collection. The song selection is almost the same for High Voice and Low Voice; (Soliloquy from Carousel only appears in in Low Voice, and My Lord and Master from The King and I only appears in in High Voice). The most accomplished composer in the history of the American musical theatre was Richard Rodgers (1902-1979), with a professional career on Broadway that spanned more than 50 years. In an edition designed especially for singers, 45 songs have been carefully chosen from both the Rodgers & Hart and Rodgers & Hammerstein output. The accompaniments support the singer, rather than containing the melody in the piano part throughout, as in the standard sheet music editions of these songs. Most of these songs are transposed for the first time ever in this new collection. The song selection is almost the same for High Voice and Low Voice; a very few major songs that are especially voice-type specific have not been transposed (for example, Soliloquy from Carousel in Low Voice, My Lord and Master from The King and I in High Voice). Highlights: Bewitched - Do I Love You Because You're Beautiful? - Falling in Love with Love - I Have Dreamed - If I Loved You - Isn't It Romantic? - It Might as Well Be Spring - My Favorite Things - My Funny Valentine - Oh, What a Beautiful Mornin' - Some Enchanted Evening - Something Wonderful - Ten Cents a Dance - Thou Swell - To Keep My Love Alive - Where or When - You'll Never Walk Alone. A capsule of 26 classics from this legendary duo. Songs include: Climb Ev'ry Mountain - Edelweiss - Getting to Know You - I'm Gonna Wash That Man Right Outa My Hair - My Favorite Things - Oklahoma - The Surrey With the Fringe on Top - You'll Never Walk Alone - and more. It's a grand collection fit for two of the most influential and successful composers of the modern era! This folio presents 70 songs from 11 of their blockbusters, complete with background information on each show and a great bio of this famous team. It also features an index by show and an alphabetical song title index. Songs include: Bali Ha'i - The Carousel Waltz - Climb Ev'ry Mountain - Dites-Moi (Tell Me Why) - Do-Re-Mi - Edelweiss - A Fellow Needs a Girl - Getting to Know You - A Hundred Million Miracles - I Cain't Say No - I Enjoy Being a Girl - I'm Gonna Wash That Man Right Outa My Hair - It Might as Well Be Spring - It's a Grand Night for Singing - June Is Bustin' Out All Over - Kansas City - My Favorite Things - Oh, What a Beautiful Mornin' - Oklahoma - Our State Fair - Shall We Dance? - Some Enchanted Evening - The Surrey with the Fringe on Top - There Is Nothin' like a Dame - You'll Never Walk Alone - You've Got to Be Carefully Taught - and more. This deluxe edition features piano/vocal arrangements of 13 songs from this beloved show - along with a CD recording of the piano accompaniments so you can sing along with a few of your favorite things! Also features bios of Rodgers & Hammerstein, a plot synopsis, and the history of the musical and photos of its productions over the years - including the 45th anniversary reunion photo of the movie von Trapps! Songs in the Broadway Singer's Edition include the vocal line and lyrics paired with faithful reductions of the orchestral accompaniments. The songs are presented in their original keys with piano accompaniments carefully crafted for playability. The CD includes performances of these piano accompaniments. 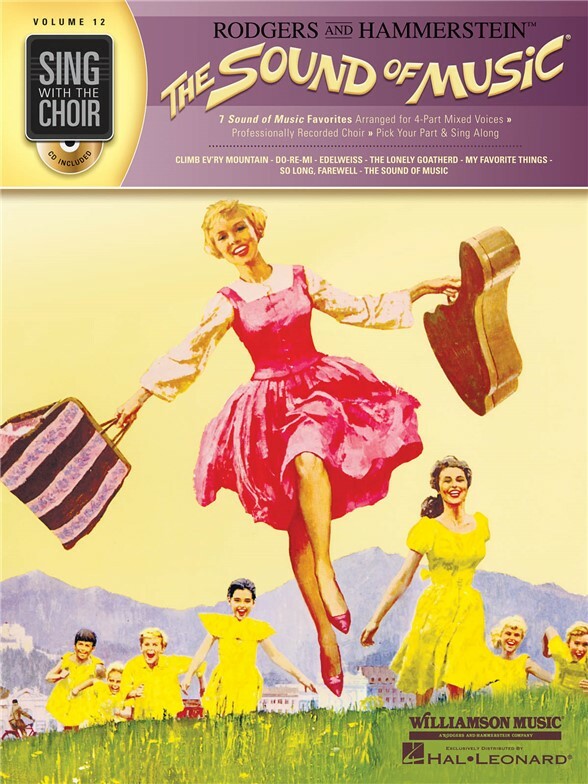 This Sound of Music edition includes a dozen songs from this ever-popular Rodgers & Hammerstein musical: Climb Ev'ry Mountain - Do-Re-Mi - Edelweiss - I Have Confidence - The Lonely Goatherd - Maria - My Favorite Things - An Ordinary Couple - Sixteen Going on Seventeen - So Long, Farewell - Something Good - The Sound of Music. Entertainment Weekly says The Sound of Music has an irresistible score that's always in tune! 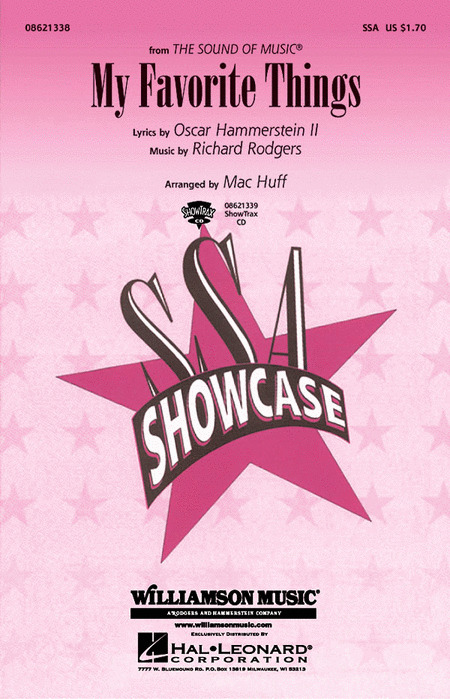 Our deluxe revised Vocal Selections features 13 terrific songs by Rodgers & Hammerstein, a biography, plot synopsis, history of the show and photos! Includes: Climb Ev'ry Mountain - Do-Re-Mi - Edelweiss - Maria - My Favorite Things - So Long, Farewell - The Sound of Music - and more. 13 songs from the United Kingdom stage production of this Rodgers & Hammerstein classic: Climb Ev'ry Mountain - Do-Re-Mi - Edelweiss - I Have Confidence - The Lonely Goatherd - Maria - My Favorite Things - An Ordinary Couple - Sixteen Going on Seventeen - So Long, Farewell - Something Good - The Sound of Music - Wedding Processional. Songs especially suitable to teens have been carefully selected for this new volume in the series. Includes notes on the shows and songs. Songs in authentic versions, chosen especially for teens, with introductory notes about shows and plots; recorded accompaniment CDs included. Soprano edition features 38 songs. Soprano edition. Songs especially good for auditions have been chosen from Volumes 1-5 of The Singer's Musical Theatre Anthology and edited to 30-40 second "16-Bar" excerpts. Each volume includes over 100 songs in original keys. More great songs for theatre singers of every description from contemporary withselections from recent shows (The Drowsy Chaperone, Curtains, Grey Gardens, Hairspray, Jersey Boys, The Light in the Piazza, Spamalot, Spring Awakening, Wicked), as well as a deeper look into classic musicals. As in all previous volumes in the series, all songs are in authentic versions in the original keys,with notes about each show and song. Available with Accompaniment CDs (2 CDs per set). 40 songs per volume. Great classic songs selected for children singers. 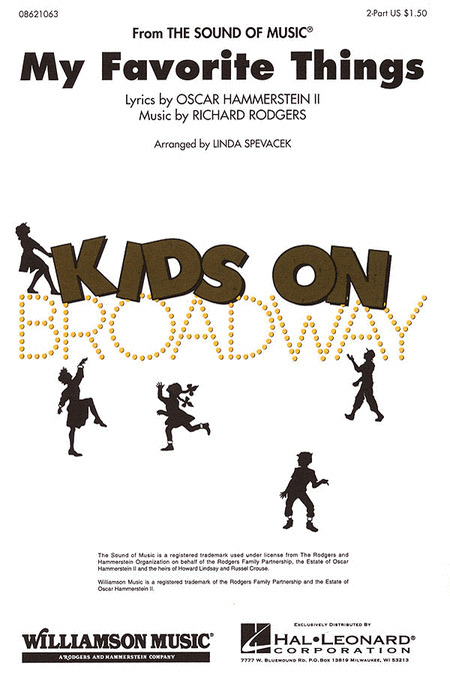 CD features performances by professional Broadway kids and piano accompaniments. This great new collection lets vocalists sing in the choir to 8 songs from the timeless Broadway and movie classic The Sound of Music. The book includes SATB parts and the CD features full performances. Turn on the CD, open the book, pick your part, and sing along! This book/audio package includes full performances by professional children working in New York, and also piano accompaniments. Contents: Baby Mine - Cruella De Vil - Edelweiss - Getting to Know You - I Got the Sun in the Morning - My Favorite Things - Some Day My Prince Will Come - Someone's Waiting for You - We're All in This Together - Wouldn't It Be Loverly. The audio is accessed online using the unique code in each book and can be downloaded or streamed according to personal preference. An ingénue, a pretty young woman, is a well-defined character type in musical theatre. The songs in this collection represent repertoire from famous soprano ingénues such as Julie Andrews, Barbara Cook, Shirley Jones, and many others, with songs from Camelot, My Fair Lady, Show Boat, The Music Man, Oklahoma!, The Sound of Music, and 18 other shows. Titles in the Original Keys for Singers series are designed for vocalists looking for authentic transcriptions from their favorite artists. The books transcribe famous vocal performances exactly as recorded and provide piano accompaniment parts so that you can perform or practice exactly as your favorite artists sang them! This volume features more than two dozen holiday hits as sung by famous female crooners. All that's missing are your vocals! The music in this book includes the lyrics, vocal lines, and piano accompaniments for eight favorites in the style of the legendary female vocalists who popularized them. The online audio tracks contain demos for listening, and separate backing tracks so you can sing along. Songs: All I Want for Christmas Is You - I'll Be Home for Christmas - Let It Snow! Let It Snow! Let It Snow! - Merry Christmas, Darling - My Favorite Things - Rockin' Around the Christmas Tree - Rudolph the Red-Nosed Reindeer - Santa Baby. Danny Elfman and Tyler, the Creator reimagine a classic soundtrack for Illumination Entertainment's Dr. Seuss' The Grinch. The film features some classic tracks from Run-DMC and the Brian Setzer Orchestra alongside new material which includes a complete re-working of You're a Mean One, Mr. Grinch by Tyler, the Creator. Each song is arranged for piano, voice and guitar with chord symbols, chord diagrams and full lyrics, alongside stunning full-color imagery from the film. This giant two-volume resource will be indispensible for teachers working with children singing solos. There is a large variety of material, from classic Disney songs to Broadway to movie favorites to songs from Sesame Street. Each volume has songs for both girls and boys. Volume 1 includes 29 songs from stage, screen and television musicals, these are by far our largest collections of solos for children. Includes access to companion recorded accompaniments available online for download or streaming. 59 songs, combined in a convenient package (combines book only of Vol. 1 00230029 and Vol. 2 00230031), offering a wealth of theatre music for children. An ingenue, a pretty young woman, is a well-defined character type in musical theatre. The songs in this collection represent repertoire from famous soprano ingenues such as Julie Andrews, Barbara Cook, Shirley Jones, and many others, with songs from Camelot, My Fair Lady, Show Boat, The Music Man, Oklahoma!, The Sound of Music and 18 other shows. Now includes a set of two piano accompaniment CDs - playable on CD players and also enhanced with tempo adjustment and transposition software for computer use. A must-own comprehensive collection of 76 songs from musical theatre, movies, folksongs and standards for any budding vocalist! This sparkling arrangement of the Rodgers and Hammerstein favorite from The Sound Of Music will make a delightful addition to any program. Available: 2-Part. Performance Time: Approx. 1:20. 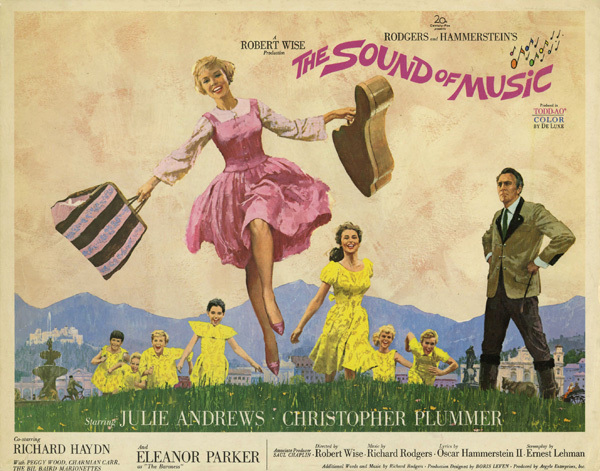 This uplifting waltz from The Sound Of Music is now available separately: SSA choirs. The cheerful lyrics and bright accompaniment will showcase for girls' groups and bring a smile to all. Performance Time: Approx. 2:45.Available separately: SSA and ShowTrax CD. This uplifting waltz from The Sound Of Music is now available. The cheerful lyrics and bright accompaniment will showcase your groups and bring a smile to all. Performance Time: Approx. 2:45. 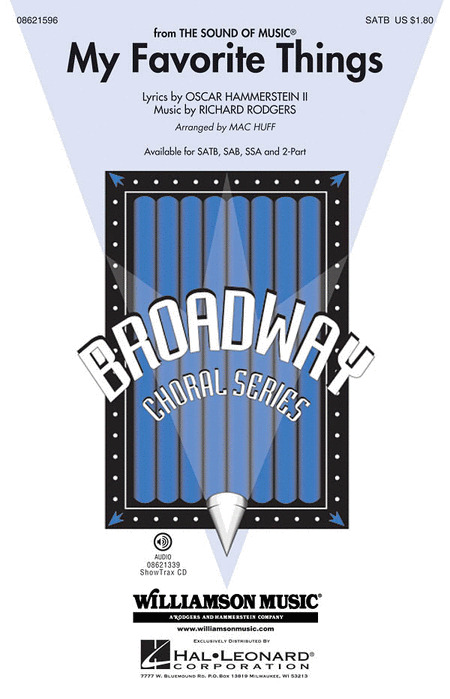 Available separately: SATB, SAB, SSA, 2-Part, ShowTrax CD. Paris Rutherford gives this classic song from The Sound Of Music a rich vocal treatment with a riviting rhythmic groove.Available separately: SATB, ShowTrax CD and Instrumental Pak (parts for Piano, Tenor Sax, Guitar, Bass and Drums). Performance Time: Approx. 4:00. Ever since John Coltrane's 1961 recording, Rodgers & Hammerstein's My Favorite Things has been a favorite choice for jazz improvisation. Mitos Andaya's SSAA setting is second to none for advanced women's ensembles and all-state honor groups. Duration: ca. 5:15 (without instrumental break).